We would love for those that attended Trek to share a special memory or thought about the event in the comments section below to make our history of Trek more robust. 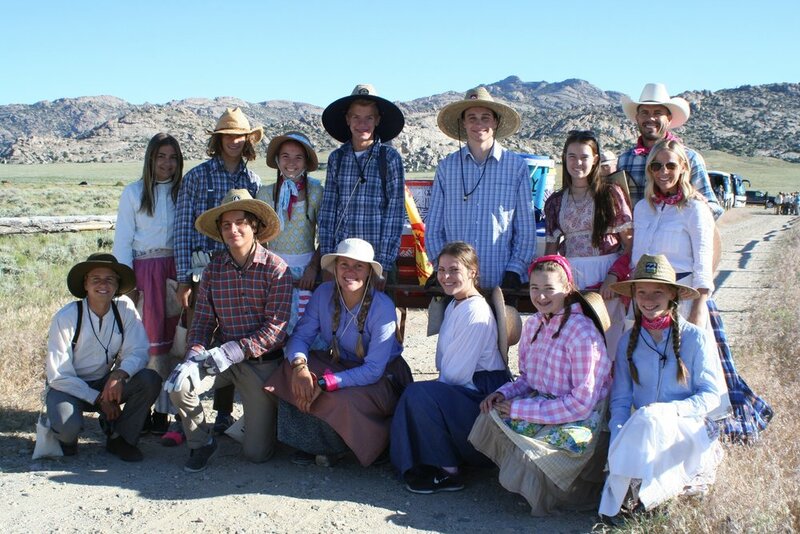 Trek 2017 "Prepare the Way"
On June 27, 2017, 209 youth and 80 adults traveled from the Laguna Niguel Stake Center to south central Wyoming to participate in a Pioneer Trek experience for youth conference that will not be forgotten. 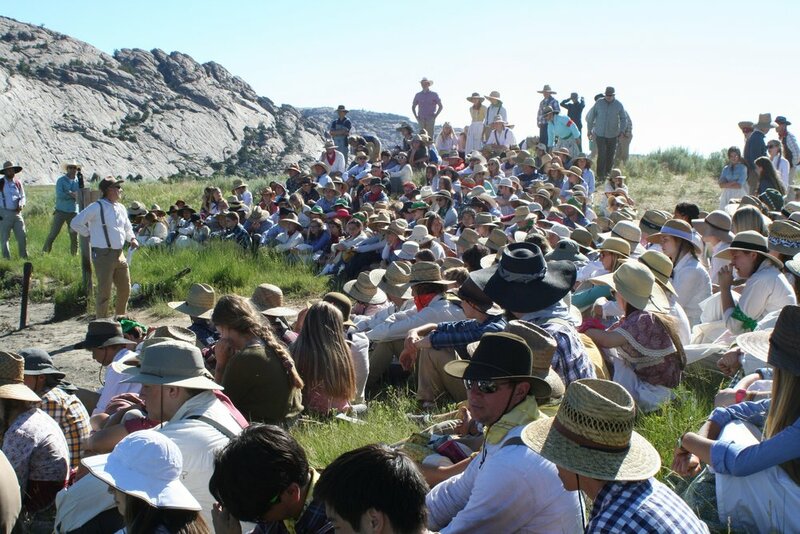 In November 2016, the stake presidency had strong impressions that youth conference should be changed from a previously planned trip to a pioneer trek where the Mormon Pioneers walked back in the mid-1800s. The decision was not made casually. As the day arrived, it was not met without challenges as the arrival time was pushed back due to bus issues. Word spread of the changed time and the trekkers arrived with a positive feeling and attitude as the Stake Relief Society provided a potato bar for the youth as they arrived and socialized before the kickoff took place. Bryan Thacker, trek Trail Boss, led the kickoff as President Davis (Laguna Niguel Stake President) gave a welcome message with a pioneer story. The youth were introduced to their Mas and Pas and their trek families that they would belong to on this journey. Following introduction activities, the busses began to load with three or four families per bus along with a Bus Captain and Food Captain. 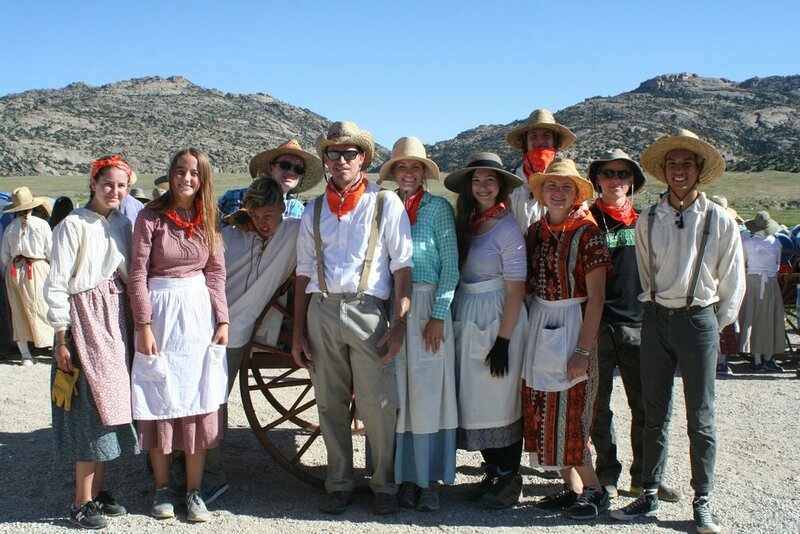 The Chuck Wagon crew had done a great job making sure there was plenty of food on each bus while Chris and Sharla Marocchi, and their helpers, made sure there were fun activities for the long distance travel. An unplanned delay along the way led to a stop at the St. George temple grounds at 4:30am where temple security opened the Visitor’s Center so the travelers could stretch their legs and use the restroom. Trek families were able to gather as President Lamprecht (member of the Laguna Niguel Stake Presidency) offered a prayer of gratitude to the Lord and asked for guidance going forward. The journey took longer than expected as the busses continued to be plagued with mechanical issues. All experienced miracles, as busses were fixed and added, but more important, the youth and leaders took this time to enjoy one another’s company and keep spirits high. Trekkers arrived at Cherry Creek Campground near Martin’s Cove with the final bus pulling in at 11:30 Wednesday night, 12 hours later than planned, but the Chuck Wagon Crew had made a wonderful dinner and everyone was excited for the next day. Thursday morning began on the bank of the Sweetwater River as President Lamprecht taught the group about what happened to the Martin Company and to understand the chronology of events they experienced prior to their being rescued and the heroic efforts of the rescuers at the river. As the group crossed the river over a bridge youth participants Kaylee Hepburn, Noah Jorgensen and Zach Graf offered their testimonies through music and word, respectively. The companies then stopped at the entrance to Martin’s Cove called the Dan Jones Amphitheater where Tyler Hepburn, Hannah Eyre and Dorje Pradhan treated the group to beautiful music and President Davis taught about the members of the Martin Company who had stayed and suffered there. President Davis then invited everyone to kneel and offered a prayer and exercised his Priesthood keys to bestow a powerful blessing on the youth. The group left, and was able to reflect on this powerful spiritual experience while they took a silent 90-minute walk through the rest of Martin’s Cove. The next stop was over the Sweetwater River using the Veil Crossing Bridge, which was built to commemorate a time when temple work was done for the members of the Willie and Martin Handcart Companies. President Ostergar (member of the Laguna Niguel Stake Presidency) talked to the youth and leaders about the importance of love, family, family history work and temples. The evening ended after traveling an hour’s distance to the next site called Sixth Crossing where the pioneers had crossed the Sweetwater River for the sixth time. 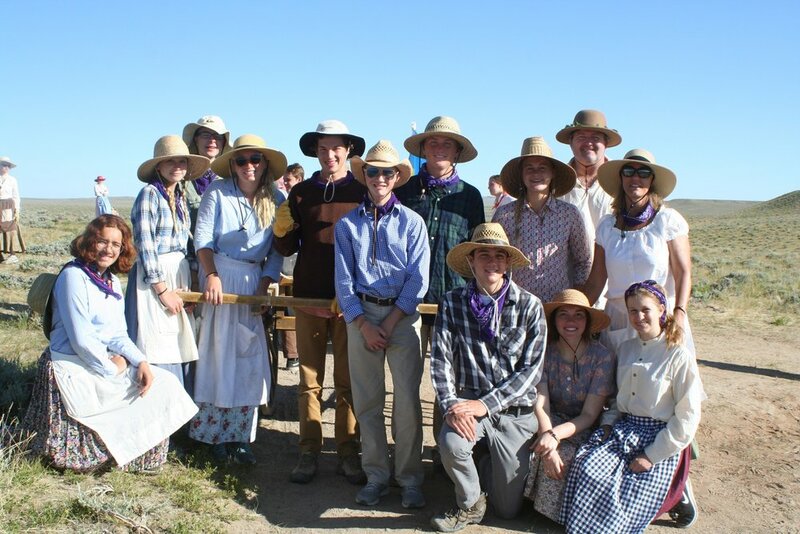 After touring the Visitor’s Center, the Chuck Wagon Crew fixed another delicious dinner, and everyone enjoyed some very fun square dancing led by the senior missionaries stationed at Sixth Crossing. Friday morning began with an early and cold 5am wake-up call, with trekkers on the trail by 7:30am. Elder Shugart led the group throughout the day telling pioneer stories and reminding everyone what unusually beautiful and moderate weather they were enjoying. Bishop Bryan Smith told the story of Jens and Elsie Nielson, who were part of the Willie Company. Peter and Darin Nielson created a reenactment of Elsie lifting her husband, Jens, into the handcart and pulling him until the rescuers came, which saved his life. Unable to hold back, kids from Peter and Darin’s Trek family rushed down the hillside to help her pull the cart. The next stop was View Ridge which helped the group understand how the pioneers must have felt seeing how difficult the Rocky Ridge was just ahead in the distance (Salt Lake Valley still 300 miles away), running out of food and not knowing if the rescuers were close. The time came for the men’s callout and women’s pull. Once the men were out of sight, the Mas gathered their girls and talked with them about what it means to be a strong and faithful woman and that sometimes women need to pull heavy loads alone in life. Bishop Tyson Weaver, simultaneously, was talking to the men and boys about the need to respect and love the women in their lives. 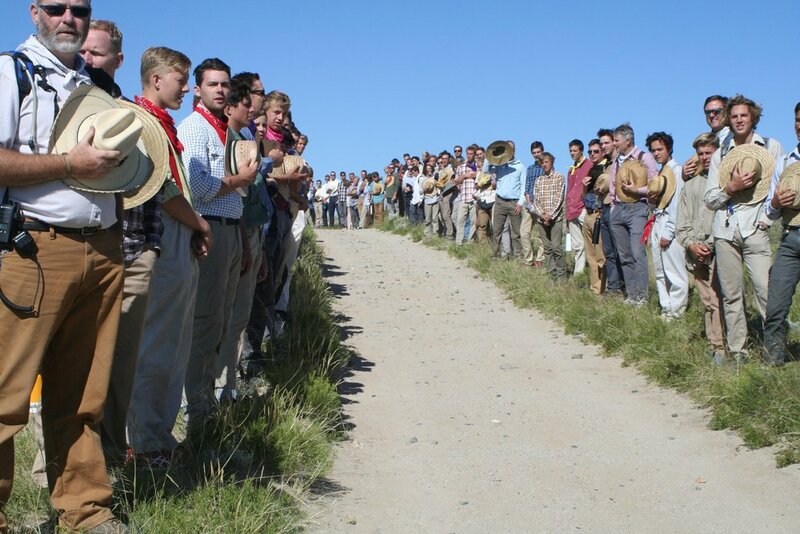 The men then lined both sides of the trail and sang The Spirit of God, as the women pulled the carts up the trail. Back together, the group cooled off their feet at a small crossing of the Sweetwater River and continued on to the main crossing which turned into a much needed water party with a lot of playing around and a very welcome break. 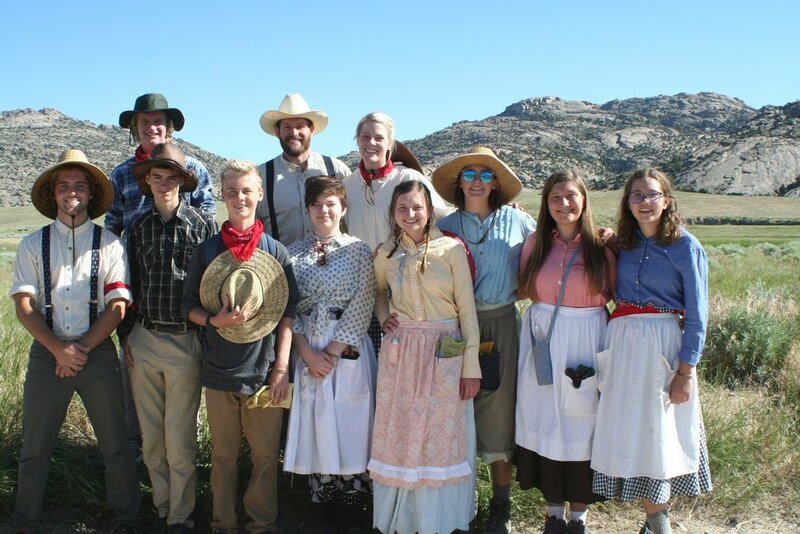 The final activity at the Sixth Crossing location was a Pioneer Concert with youth singing and playing musical instruments presenting anything from hymns to satirical tunes poking fun of bus problems. With equipment and camp cleaned up, the 90-minute drive to Rock Creek Hollow commenced. Rock Creek Hollow is an idyllic spot on the Rock Creek where the Willie Company camped on October 23rd and 24th in 1856 after a grueling handcart pull in freezing and blizzard conditions. Soon after they arrived at camp, 15 pioneers ranging in age from six to 67 died and were buried in a common gravesite, which today is fenced off and has a memorial next to it. Our group entered this area in a reverent manner and President Davis welcomed everyone to the final devotional meeting of Trek. He then went on to recount stories of those who perished there, and the sacrifices the pioneers made to serve others and follow the prophet and the Lord. He then explained that there are many places in the world that are “sacred” because what had occurred there but that this spot had been declared ‘hallowed’ ground by President Gordon B. Hinckley (prophet of the church.) ‘Hallowed’ because the Savior had personally visited this place while assisting those pioneers who were giving their very lives during those final moments of sacrifice. The youth then gathered with their Trek families and had a chance to be alone to read letters from home. The Spirit was felt strongly this final night of Trek, and for many, the moments at Rock Creek Hollow were the most impactful because of the hallowed nature of the area. These memories are a sweet reminder of God’s love for us and how He desires to teach and strengthen us. The drive back home was mostly uneventful, with a fun stop at a water park in Las Vegas, and a few warm busses. Trek was an opportunity to learn of the past, better understand who we truly are through the memory of pioneers who had to learn the same thing, and see what God wants us to become as we prepare for future service and leadership opportunities. 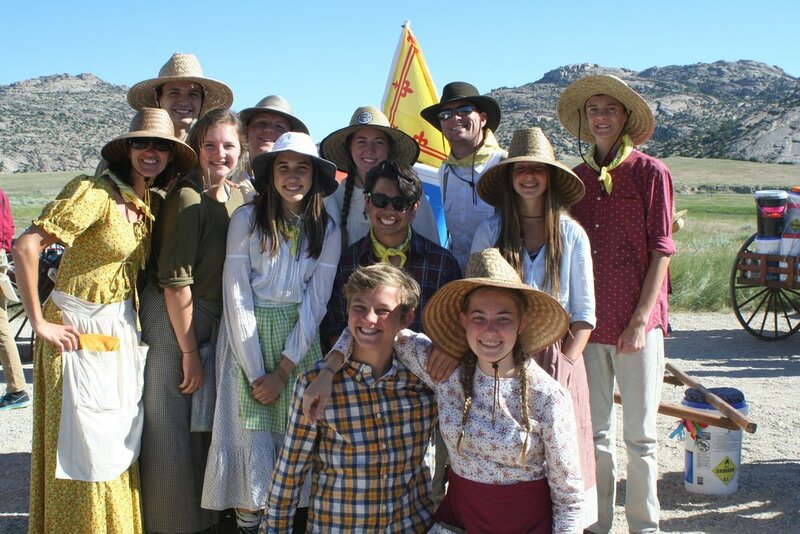 We are grateful to the leaders of the Laguna Niguel Stake, the Trek committee crews, and particularly to the youth who came on Trek with open hearts and full of faith, all of which made this Pioneer Trek 2017 a memorable and testimony building experience. If you attended Trek, please comment below with a memory or thought to add to our Trek history.